The famously unorthodox Altman structure came down to a principle best described in his own words: “we showed up, created our own events, and then filmed the results.” In more cohesive terms, that meant his material reflected the instantaneous, unrehearsed bravado of actors as they were thrust into situations they could not anticipate, where they were expected to respond with an instinctual exercise of dialogue and emotion framed within the context of their characters. An incidental wisdom rose within that sense of possibility: because no two takes would ever be the same, his film would play less as a strategic formulation of paradigms and more as an organic descent into an intricate movement, where such morsels seem like ordinary practices within the culture of the players. Years pass and some of these themes seem topical, almost outdated – but others, many others, endure almost like accidental prophecies. The movie is never more pointed than when it confesses the underlying sadness of simple people. The setting is Nashville in the months preceding the next Presidential election, and a grass-roots candidate named Hal Philip Walker has emerged as the favored voice of the people – eloquent and persuasive, with ideas that reach deeply in the minds of disgruntled voters (Altman credits this detail as a projection, of sorts, to the Jimmy Carter campaign). His words appear throughout the movie as a van rides through town, carrying a loud speaker on the roof, while citizens gather for an impending series of public concerts indirectly in his honor. One of Walker’s more eager onlookers is played by Barbara Baxley, and in a key moment during an off-the-shoulder interview with a reporter she makes comparisons between he and the Kennedy brothers, who too were full of good ideas but, as history proved, became victims of a world that was fiercely protective of its corrupt systems. Her drunken, heartbreaking confession plays not just as a forecast for the film’s infamous third act, but as a microcosm for feelings that gradually permeate throughout the mad rush of the town’s anticipatory celebrations. Among an ensemble of 24 prominent speaking roles, a small cluster of them are only playing the part of enthusiasts; beneath elaborate masks others seem to be concealing wounds with a surprising sense of grace. There is Lily Tomlin, for instance, as a singer in the local gospel choir whose free time is split between community events and the education of her deaf children; though married to a local public figure (Ned Beatty), his emotional distance triggers a yearning that will inevitably be exploited by another (Keith Carradine). 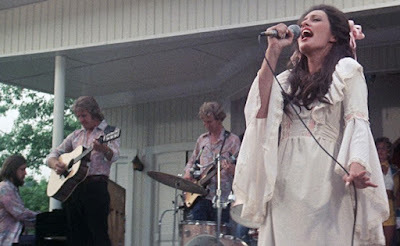 Then there is Barbara Jean (Ronee Blakley), the talented and revered Nashville singer who comes into town eager to entertain, only to find herself crippled by fatigue and self-doubt; in one of the film’s most honest scenes, she asserts a pained realization of her ongoing exhaustion to a crowd that only knows of her as jovial and charming. That she is the muse to two local aspiring singers – each destined to experience their own moment of pathos before the film has ended – only emphasizes the greater perspective of the Altman methodology, where vulnerability is often the most forgotten detail in an ethos that must mask it with glitz and thrill. What is Altman’s decisive intention? The answer changes depending on the source and its origin. 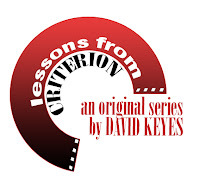 The greater critics of his time – Pauline Kael, Gene Siskel, Roger Ebert – suspected it was less about a political landscape and more about emotional currents in a vast setting of social collisions. Modern ones argue that it is a damning statement against the culture itself, and indeed hindsight supports that theory: no one who saw the film in Nashville felt it captured any favorable element of the country movement, and many perceived it as a shameless critique of their closed system. Their fears, perhaps, were realized by the unorthodox tactics of the director. Existing singers in Nashville were never asked to contribute music to the endeavor, and almost all the songs in the final film were written on the spot by the very actors singing them (only Ronee Blakley, at the time an aspiring singer, was a credible songwriter). And Gwen Wells, who plays a bad vocalist with mistaken impressions, has a wicked duality; she is like a symbol of all that is wrong with the method, although no one is kind enough to save her the embarrassment until well after the hardest impulses have played out. In reality, the young Altman was simply cutting his way through an elaborate experiment of human quirks to discover, however accidentally, what made simple people behave the way they did when they lacked the control of the moment. Playing into that philosophy, his film represents an overlapping succession of momentary research, ranging from a traffic accident (the first five minutes) to the gradual breakdown of a celebrity (the Blakley character) to the honest observations of the marginal and, ultimately, to the shocking political assassination towards the close. The one common thread is the BBC reporter played by Geraldine Chaplin, who waxes poetic through most of the picture like an overachiever mugging an audition (although there is no audience for the words she utters into a tape recorder). Through recording sessions and bars and local gatherings and picnics she wanders, earnestly observing, sometimes partaking, ultimately experiencing. There is even a moment where she willingly becomes a notch in the bedpost of the local rising star (Carradine), despite his tendency to bed anything with a set of breasts. But those encounters do not expand her knowledge of Nashville as much as they detach her from the impartiality of her position, and when the time comes for a fallout in the wake of the last scene, she offers none of her own – like all others, this is now a woman who is too desensitized by the last few days to make any sense of the actions. Her feelings echo that of first-time viewers, who share the bewilderment and awe right down to the almost perplexing intricacy that follows the film through many of its busiest moments. Like an enigmatic panorama, the movie exists across multiple layers that rarely collide. But a solution to the puzzle is hardly the point, just as it is impossible to decipher a single reason why anyone behaves the way they do. The picture, like its characters, is a consequence of clashing ideals. And yet the delivery is so sincere, so precise and meticulous, that we are compelled to keep our eyes on every single frame – sometimes more than once. If a first viewing at least piques a morsel of interest, a third or fourth exposes the raw soul of the material. A great number of people – some charming, others curious, and a great many others selfish – will pass through these cameras at any given moment, drawing our ears away from one conversation to the next, but always the heart of this culture lies with women who are wearing elaborate facades to cloak a deeper struggle. In a time when the feminist movement only seemed to be notching towards second gear, here was a filmmaker who was already in complete sympathy with his female leads. If that prospect was ever in doubt, the performances bring it to undeniable emphasis. Watch how Blakley, for example, processes a handful of scenes where she is stricken down with an emotional paralysis; distant and detached, her face wears a mask of cordial joy while her eyes seem pleading and exhausted. Nowhere is that more obvious than the critical outdoor concert sequence, which was famously improvised on the spot – Altman wanted his withered heroine to unravel before the eyes of her adoring fans, and here Blakley alternates between songs and anecdotes that ultimately end with a depressing breakthrough (“Seems like I’ve been working my whole life,” she somberly observes). How did she arrive there? What sort of struggles went on behind the scenes? In a way Altman provides an indirect testimonial through her two would-be understudies. The first, played by Barbara Harris, is rarely seen as a focal point until the final act; she spends most of her time walking through town, nervously avoiding her husband, who is set against her aspirations for stardom. But her plight is exemplified, quite unexpectedly, in how the movie handles one of her earliest attempts at garnering attention: she is given a chance to perform for a gathering crowd at the racetrack, except that the speeding cars prevent anyone from hearing a single note. The Gwen Wills character faces fewer obstacles, although her inability to enchant an audience is lost on her until far too late. This inspires the film’s cruelest moment, when she is hired to perform in front of a group of men without initially knowing their intentions; they care nothing about her vocal ability and have only paid to see her body in striptease. Any conclusive answer to that inquiry would have been reductive to him, obligating the film to fit the box of a moral test. Others in his tremendous catalog certainly offer that potential – particularly “3 Women,” his greatest and most challenging – and there are brief episodes scattered throughout isolated scenes that seem to be speaking directly to a point without circling around a vague possibility. But “Nashville” requires no firm deduction, nor does it seek to conform itself to any single image we may possess of its deeper meanings. Each experience belongs only to that of the character enduring it. What we are united in, especially towards the end, is our collective fascination with the decaying standard of public rituals, and how we may be destined to respond passively even to something that ought to cause tremendous shock. The great Cormac McCarthy once referred to this prospect as the “dismal tide.” Had Altman lived long enough to see where political norms exist now, one suspects he might have been eager to downgrade the term further. "Nashville" is the twentieth article in this series.